My freezer will need defrosting soon… I’m waiting for the temperatures to drop so I can just pop everything outside while I de-ice it, but there’s no sign of winter yet… So in the meantime I did a stock-take and found lots and lots (and lots) of frozen berries! 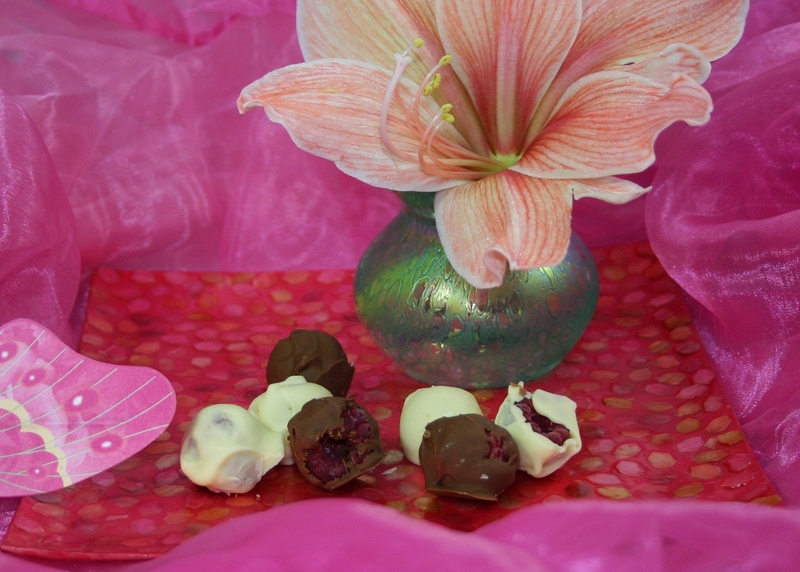 Simply melt some white chocolate in a bain-marie and, while it’s melting, line a freezer-proof tray with parchment. Now the fun bit – whip half a punnet of raspberries (or other berries) out of the freezer and dunk in the chocolate, roll around using a cocktail stick and put on the parchment. You have to work quickly, as the berries shouldn’t defrost! Put them back in the freezer immediately. Repeat with the milk chocolate. I used 100g (4oz) white and 100g milk chocolate for a 250g (1/2 lb) punnet of raspberries. Can be eaten directly from the freezer, or leave them to warm up a few minutes. This entry was posted in Food, Recipes and tagged Food, Recipes, Vegetarian, Winter. Bookmark the permalink. MMMMM!!! I love raspberries and chocolate! Superb – chocolate and one of your five a day in one hit – inspired! Oh how yummy! I have lots of blackberries in my freezer along with some raspberries – I may just have to try this delicious treat of yours. Blackberries would be so tasty too! How decadent! 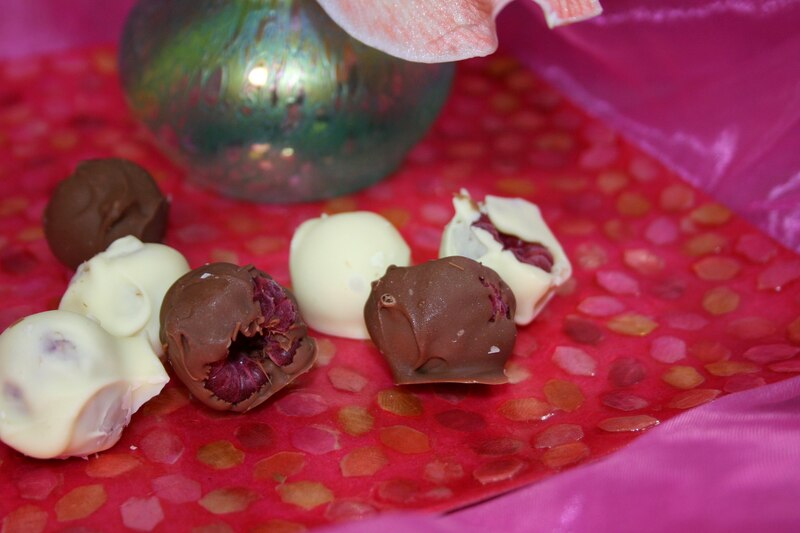 One of my favorite combinations- raspberries and chocolate! White chocolate is my favourite, but the milk chocolate ones are really good as well! I’m not sunrised they don’t last long! I meant to add a word or two about your outdoor freezer – a great idea!! We always have a cold spell at some stage, where the temperatures go down to 14-20°C below zero for several days – last year several weeks… I’m still waiting! Apart from neat chocolate, I’m not too keen on sweeties but your photographs were amazing. The first one with the lily has a surreal quality to it. Thanks! While tidying away the Christmas decorations I knocked my Amaryllis exotica and rescued one of the last flowers… it was the perfect accompaniment! I have frozen blueberries in the freezer…. Oh, YUMMMM! I’m heading into the kitchen now…thank you so much!!! keep for long. So pretty photos! The first one with Amaryllis exotica looks like a painter´s still life. Look delicious! Your Amaryllis is pretty. Mine sent up leaves but then fizzled out before blooming (but I hadn’t taken care of it during the year so shame on me). Well, that’s the no chocolate in January resolution blown – great idea though! Beautiful photos of the candy you made. Thanks – they taste good as well as looking pretty! 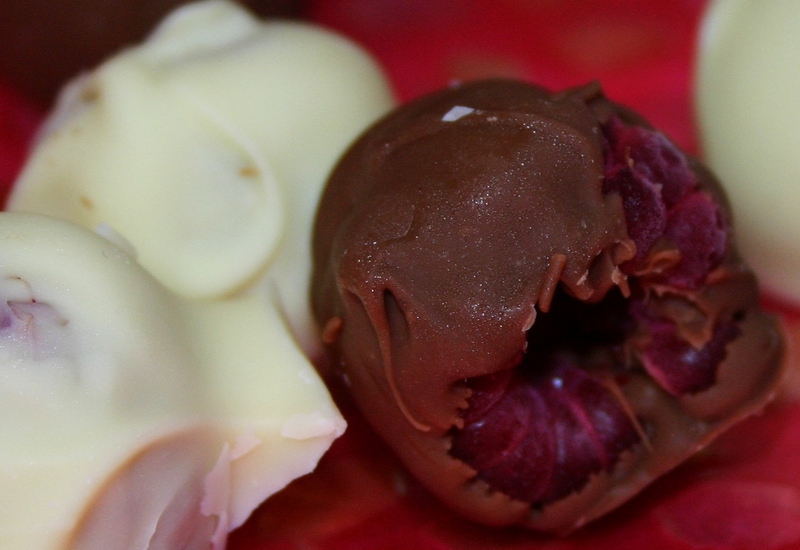 I’m drooling over here after seeing those chocolate-covered raspberries! Seriously, fantastic looking! I can’t wait to go berry picking next spring! 😀 You must try them! Grapes will be lovely! This is a good time of year to make plans, and to dream of summer!